My good old friend A.-M. invited me to Freiburg over the weekend, as we had to celebrate her 30th birthday. Yeah! We know each other since 17 years now, and have become really good friends some years ago. She actually is the one who “allowed” me to refurbish her bathroom – a story I blogged two years ago, and which was of particular interest to me, since I had never done that before and, having an interest for such technical issues, getting more experience by simply doing it was a great idea! Fellow blogger Afromusing already asked for some pics, as she highlighted that Freiburg is “the model town in energy sustainability”. As I just went there for two days for a party, I didn’t take this opportunity for any sightseeing. However, Freiburg is known to be the sunniest city in Germany, and with modern districts like Vauban, lots of cyclists and other green stuff, one soon understands the sustainability approach the citizens have come up with in the past. On to something completely different: A.-M.’s “dead” Acer TravelMate 290 notebook. One day it just stopped working and refused to restart. Pressing the power button resulted in a 2 seconds activity of the fan, a few LEDs blinking – and a blank screen. Nothing else. As A.-M. needed a working notebook, she eventually decided to settle for a new machine and stored this one in the closet. Mzeecedric actually passed by her place the other day and helped her securing all data from the old HDD (thx, bro!). She even took the old computer to a “PC guy” at her company, who quickly advised her to buy a new computer (through his channels, of course) as he couldn’t fix this one. Dismantling it of course didn’t bring about any change, as I had anticipated that some cleaning with Isopropanol and fixing any loose & dry contacts would awake this machine again. 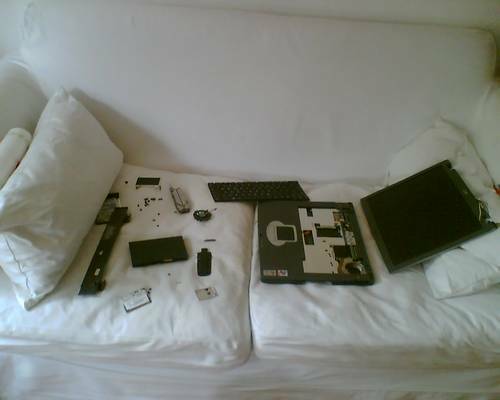 Nothing happened though – after reassembling the laptop, it still refused to awake from the dead. This morning then, I had a chance to quickly google for some keywords and one user forum suggested to try the “15 seconds trick”, which is done by removing the battery and the external power supply and pressing the power button for 15 seconds, thereby discharging all condensers on the mainboard. As I had instinctively tried that before, the machine still didn’t show any life signals. Again, a dark screen and 2-5 seconds of blinking LEDs. Most users would give up at this stage, I guess, and since the warranty on this 3years old laptop had already expired, a sale on Ebay seemed to be the most plausible further procedure. Unless of course I would try another “trick” I had read on another user forum: there is a very tiny “jumper” (J1) on the mainboard, just underneath the RAM compartment, which actually isn’t a real jumper as we know it from desktop computers, but instead just some blank soldering points that need to be bypassed for a few seconds. This – and that’s the initial reason why the machine refused to start – resets the BIOS. After doing that, the laptop started again and loaded the operating system as if it had never been half dead. Wow, JKE, congrats on this one! You’re a real jua-kali geek! Btw, your page looks quite fine with Safari 3.0.2 Beta. Aegus, welcome back! Geeks @ KBW, that’s just nice!